transitive verb [ádv? kàyt] (past and past participle ad·vo·cat·ed, present participle ad·vo·cat·ing, 3rd person present singular ad·vo·cates) recommend or support something: to support or speak in favor of something noun [ádv?k?t, ádv? kàyt] (plural ad·vo·cates) 1. somebody giving support: somebody who supports or speaks in favor of something a tireless advocate of social reform 2. helper: somebody who acts or intercedes on behalf of another 3. law legal representative: somebody such as a lawyer, who pleads another’s case in a legal forum [14th century. 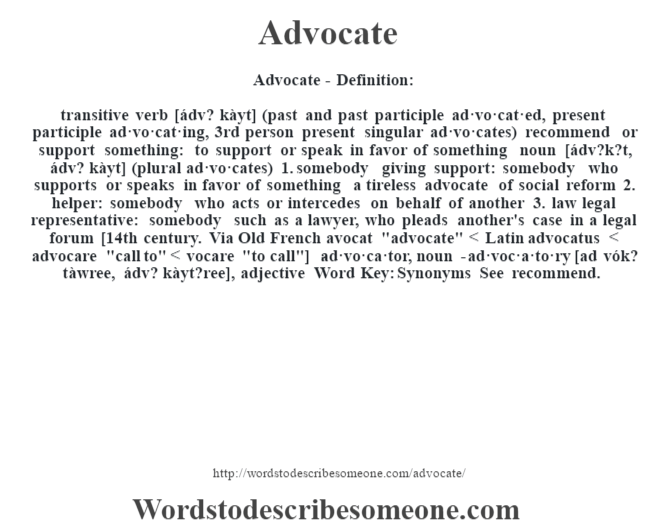 Via Old French avocat “advocate” < Latin advocatus < advocare "call to" < vocare "to call"] -ad·vo·ca·tor, noun -ad·voc·a·to·ry [ad vók? tàwree, ádv? kàyt?ree], adjective Word Key: Synonyms See recommend.